Encourage a child’s love for drawing, storytelling and comics with the award winning My Comic Book, a complete kit for writing, illustrating and publishing their very own comic book. From super heroes to true stories, My Comic Book brings a child's imagination to life as they follow their characters' adventures on the pages. Comic book lovers of all ages can create a lasting keepsake through the fun and educational process of writing and illustrating your own comic book. Winner of 3 awards including: 2017 Creative Child Magazine Product of the Year, 2017 Creative Child Magazine Creative Play Award & 2017 Tillywig Toy Award Winner - Best Creative Fun. My Comic Book – Create Your Own Comic! 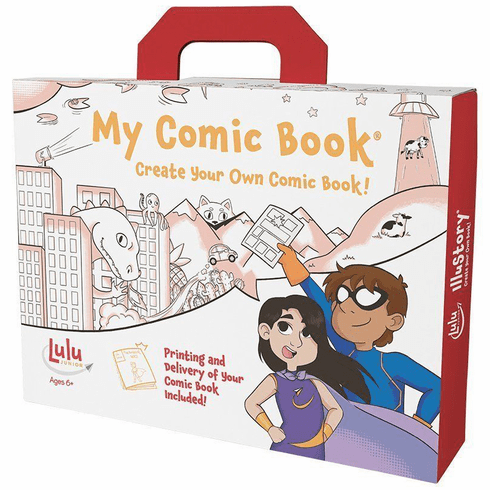 is the newest version of the award-winning comic book making kit for children. This new version features an updated “Comics in Action” guide book that navigates your child through creating their characters, settings, panels, words and artwork for their comic book. Everything contained in the My Comic Book kit allows a child to write and illustrate their own full-color, 18 page, professionally printed full-color 6.75” x 10.25” comic book. Our “About the Author” feature gives your child the option to be showcased as the published author on the book’s back cover. Please Note: The completed books can only be shipped to US, APO/FPO, Puerto Rico and the US Virgin Island addresses. At this time they cannot be shipped to non-US addresses.